It’s a no-nonsense commuter of sorts, this hatchback. The car lacks downright drama in the looks department with its diamond-shaped grille and the stretched-back headlamps up front. What lends the profile some character are the lines that run along its sides to the shapely yet rather simple rear section. What definitely looks out of place on the Go are those skinny 155/70 R13 tyres within its large wheel arches. Open the featherweight doors, and you’ll notice some rather austere interiors. Once in the driver’s seat, you are greeted by a three-spoke steering wheel ahead of a simple instrument cluster – of a speedometer, digital display where you can toggle between the odometer, single trip, distance to empty, average fuel consumption readout and a fuel gauge. Inside, it’s easy to identify the parts that have been carried over from the Micra like the air-con vents, indicator stalks and door levers. What’s new here is the Aux-in audio input with a smart phone holder. There’s no CD player or radio as well, however the Go does have a USB socket that can only be used to charge cell phones and such. Datsun says that the Go is aimed at Indian families of four to five members. Those intentions are made very clear seeing both the gear lever and pull-type handbrake which are a part of the centre console to make room for a bench seating arrangement in the front. This might cause some of those old Padmini and Ambassador owners to rejoice knowing that they can once again squeeze a child or a skinny chap in between the driver and passenger sitting shotgun. But it's not all that safe if there actually are three individuals seated up front, with the absence of a seatbelt for the person in the middle. Seating at the rear can accommodate three adults with more than enough leg room. There's also a big 265-litre boot that'll swallow a good amount of luggage. Fit-and-finish levels are good, but the tint of grey hard plastics makes the otherwise airy cabin look a bit dull. There are power windows for the front doors while those seated at the back have to roll with this show manually. There’s a fair bit of cost-cutting that’s quite evident in the cabin too, like the fact that the driver only has access to the power window on his side. You’ll have to stretch across to the other door to open that window. Then there’s the bootlid that lacks insulation material, while the rear seatbelts don't retract by themselves. Slot the key in and fire up the three-cylinder, 1,198cc petrol pot (same as the Micra) rumbles to life. With 64bhp and 104Nm of torque on tap, the Go is a little underpowered when compared to the Micra, but due to its light weight, it proves to be quite a frisky performer. The engine has got some good low-end grunt, but the real sense of urgency kicks in around the 3,500rpm mark before redlining at 5,000rpm. Vibrations seep through into the cabin at idle, but they iron out after you're under way. With good visibility all around, with the driving position being very comfortable, but you will find the front bench too intrusive to your shifting of gears. Tap on the gas just a little bit and the car is eager to get off the line. This, coupled with the extremely light steering makes it really easy to drive the Datsun around in touch-and-go city traffic. The short-throw five-speed manual is also light and feels slick to use. The seats themselves are flat and have fixed headrests. In the Datsun, there’s generous legroom and thigh support on offer and but passengers seated at the back will complain about the lack of proper forward visibility thanks to the front bench with its non-adjustable headrests. The Datsun Go lacks some vital safety features like ABS, while there aren’t any airbags either. Low-speed ride is supple, but the suspension crashes over bumps at speed. There’s a good deal of body roll during cornering too. There’s some road noise that filters into the cabin too, which once again goes to show Datsun cutting costs, by choosing not to provide any sound absorbing cladding in the wheel wells. 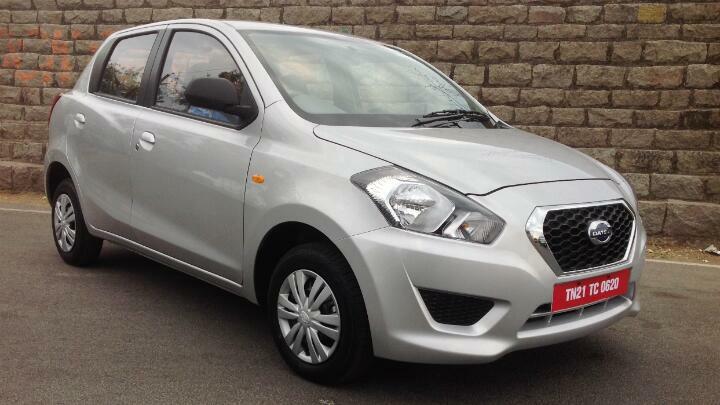 The Datsun Go is an easy car to drive though, and out on open stretches of road, straightline stability is good. The speed-sensitive steering weighs up as you pick up the pace, but manages to feel a bit spongy at the same time. Datsun has revealed that the base variant of the Go will start at close to Rs 3.2 lakh while the top-end variants will be priced below Rs 4 lakh. The Japs also state that there’s a two year/unlimited kms warranty when the Go goes on sale later on in the month, and that it will return a claimed 20.6 kilometres to the litre. In terms of its pricing, the Go's main rival will be the Hyundai Eon and in terms of sheer size (and performance) alone, the Go manages to marginally dwarf the Korean. The Go, however, falls behind the Eon when comparing their lists of features, but the Datsun has definitely inched out in front of the Hyundai in the space race.